You’re a veteran in the money business and you’re living proof that hard work pays off, but what do you do with it? You have sacrificed years of your life to build your business and no one has worked harder than you, but you know what they say, you should work hard and play even harder. It’s time for all the all-nighters, after-hours, extra jobs, and missed birthdays to be worth their sacrifice. Any self-made man or woman would love to have any of these epic rides to show for all of his or her success. Without further ado, here are some of the coolest transportation toys out there. Have you ever wanted to soar to more than 10,000 feet in the air? The Airtime Aircraft will make your dreams come. You don’t need a pilot’s license for liftoff. With the ability to travel over 300 miles with only 12 gallons of fuel, it’s safe to say that this luxury airline won’t break the bank. It’s a glider plane that can wind down at half the speed of a parachute for a nice, cushioned landing. Anyone who is looking for a new toy complete with bragging rights should look no further. 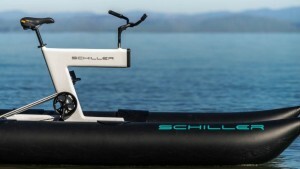 The Schiller Bike is unlike anything you have ever seen before. Those living near waterways will find that these bikes are a great source of exercise and entertainment. 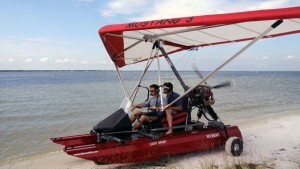 They are a bike-boat hybrid with a unique flotation system which allows for pedaling across the waters. You can really work those leg muscles in no time. Forget the ferry! Forget spinning class! Get your morning workout on the water and stay dry as bystanders stare on. Certainly, no one’s seen that gym class before! Whether you loved the items on our list for their convenience or just plain awesomeness, these five epic rides will be worth your extra cash. Looking cool with your new toys is just a perk.